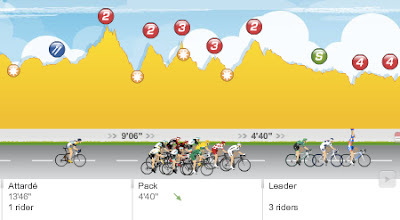 The day saw an additional 8 riders abandon the 2011 Tour de France (so far). The teams of Omega-Pharma Lotto, Radioshack, Astana, Quickstep, Team Sky, and Katusha have all lost their lead rider. Of the 198 riders that started the Tour, 180 remain after 9 days. Although Andreas Kloden is a possible non-start for Stage 10 on Tuesday (tomorrow is a rest day) due to back pain suffered in a crash today. It was a terrible negligent act today by a France TV car driver that injured two riders in a breakaway 35km from the finish, involved were Johnny Hoogerland and Juan Antonio Flecha. Video of Crash. We watched as both riders painfully, with determination, got themselves back on their bikes and into a pack. Hoogerland miraculously finished in 139th place, and Flecha in 90th. I was willing for all sorts of rules to be bent to bring Hoogerland back into the fold after a quick change of his shorts. In the end there were two large packs that came in behind these two riders. Included were Mark Cavendish and Bernhard Eisel, at 21'26" behind the stage winner. David Zabriskie (Garmin-Cervelo) withdrew from the race today after a crash fracturing his wrist. He is the current US National Champion Time Trial Champion and was hoping for a win in the ITT at the Tour. Bradley Wiggins (British National Champion Time Time) and Christophe Kern (French National Champion Time Trial) are also out of the race. Luis León Sánchez (Spanish National Champion Time Trial) won Stage 9 today into Saint-Flour, and is definitely still in the race. So are Edvald Boasson Hagen (Norwegian TT Champion), Adriano Malori (Italian TT Champion) and Fabian Cancellara (the one and only World TT Champion)! They will have to stay upright until the penultimate day of the Tour - Stage 20 to show their mettle. The big news is that Vinokourov is out of the Tour de France with a fractured femur and possible hip fracture. After the large crash that injured Vinokourov, Zabriskie and several other riders, the peloton slowed. Through it all remained Thomas Voeckler narrowly escaping the needless accident that took out Hoogerland and Flecha in his escape group, but still somehow at the front with Sandy Casar and Luis León Sánchez. There is something about Thomas Voeckler that embodies everything that the French love so much about the Tour de France, I am always happy to see him do well in the Tour. It is worth studying the results from the day (huge changes): a complete list of all withdrawals and riders no longer in the 2011 Tour De France. Complete Stage 9 standings. New overall GC standings after Stage 9. 181 VOECKLER Thomas TEAM EUROPCAR 38h 35' 11"
41 GESINK Robert RABOBANK CYCLING TEAM 38h 39' 12"
TEAM EUROPCAR 115h 03' 31"
Johnny Hoogerland was awarded (as if this was an award he would have chosen!) the most combative rider after the stage, so too did Juan Antonio Flecha, they were the first tandem recipients in history. I wondered if they would wear the red dossard tomorrow, after seeing this photo of his barbed-wire injuries (photo by Steephill.TV). But Hoogerland is being very gracious and not blaming the driver of the car. A bit of trivia: the fewest number of riders to finish the Tour de France was in 1919 when only 10 finished out of 69 starters. It has been worse in recent years (or so Cyclocosm tables), but we are only 1 week into a 3-week stage race. To bring a smile back to your face - take a look at what the Saxo-Bank riders ate for dinner tonight. I wonder what Alberto ate?